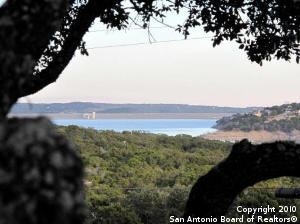 Description: Great view of lake & dam from deck shaded by majestic oaks! Cathedral beamed ceiling with wall of windows to enjoy lakeview! Handsome stacked rock fireplace! Recent berber carpet & exterior hardy board! Office at top of hill with front porch & covered parking plus 1 car covered parking at property entrance! Huge master w/ walk in closet plus storage up or bedroom down w/ walk in! Quality built! Hard to find at this price! Near boat ramp, neighborhood pool & amenities, golf & comal park! Must see! Hurry!